In ancient Roman or ancient Greek mythology there is a beautiful story about a very beautiful, one might even say, divinely beautiful young man named Ganymede. His beauty was so captivating that the nymphs and even the goddesses of Olympus instantly fell in love with him. In the end, Zeus himself fell in love with him, exactly. and he simply did not think of anything else how to kidnap Ganymede so that he would not get to any earthly woman or nymph or goddess. 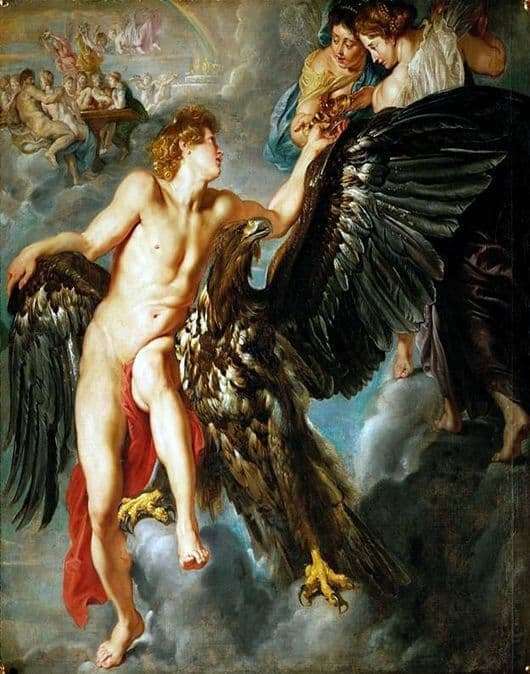 Zeus was transformed into a huge eagle, which he did, incidentally, often, and on the wings lifted Ganymede to Olympus. Soon, Ganymede was granted immortality, and he became a cup-bearer at Olympus. Although no one used wine in Olympus, except for Bacchus. The gods mostly drank nectar on Olympus, but nevertheless Ganymede had just this position. He stayed on Olympus. And Rubens captured this particular abduction. The main thing on this canvas is the eagle. He is so realistic traced that it seems that he will come to life and fly away, together as a beautiful young man. And by the way, Rubens on this canvas told this myth completely, showing all stages of the story. And even pointing out what Ganymede will do on Olympus. Notice what exactly Ganymede girl stretches… It is a cup, a large gilded cup for wine. All the action takes place already in the sky, already on Olympus, already during the feast, because in the distance the gods are visible at the table where angels serve them. That is, Ganymede, already performs its duties and distributes bowls of wine. And by the way, Zeus did not return the young man, he left him for himself… As stated in one source of mythology, “Ganymede shared a bed with Zeus.” It is difficult to say whether this is so or not, but the fact that the young man was constantly confirmed by other sources. Of course, this topic is now very relevant in our time, but in the time of Rubens it was completely under a kind of serious church ban. This was an obvious sacrilege, but as life shows, many often violated the prohibition. The forbidden fruit is always sweet, but certainly not to that extent.